Our easy to follow descriptions will help you decide what balloon decorations are the perfect choice for your special event. Mainly used as centerpiece for tables, the balloon bouquet really is the heart of a balloon display. 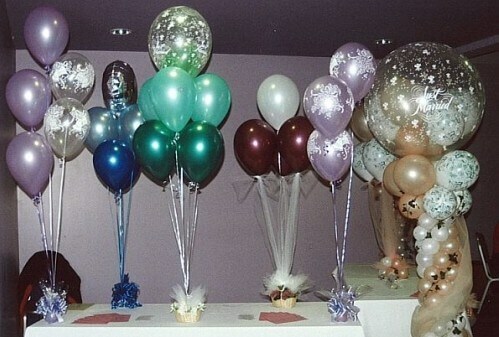 Between two and nine balloons, tied to curling ribbons, are arranged in different heights and attached to a table base. In the examples below the base is either a weighted flower basket or a sand filled balloon. Yet it can be practically any decorative item that is heavy enough to hold the balloons in place and where the ribbons can be tied to. 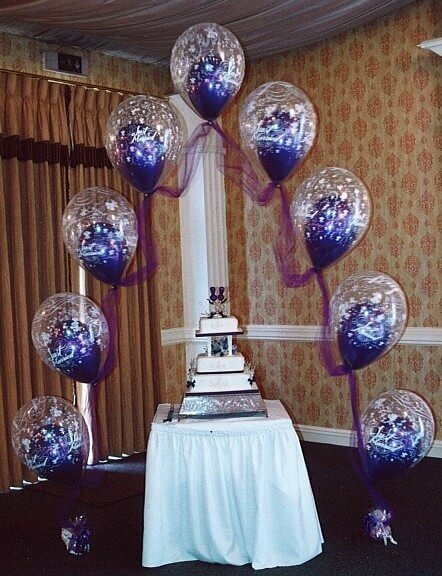 A balloon centerpiece can be made of latex OR mylar (also known as foil) balloons OR you can combine them. As the balloons have to be helium filled this choice determines the lifespan of your balloon decorations. Whereas mylar balloons will float up to 14 days, even the highest quality latex balloons won't stay up longer than for about 12 to 24 hours. However, by using a product called 'hi-float', it's possible to make them last 10 to 25 times as long! Naturally balloon arches fulfill their purpose best when you can walk through them! So they are ideal balloon decorations for an entrance or exit. Often they are also used to frame the head or cake table at a wedding or to create a spectacular stage decoration. 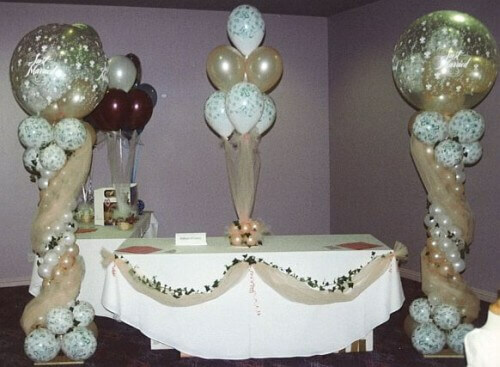 Unlike with bouquets you have the choice between a helium or air filled balloon arch. A floating arch is made of single helium filled balloons lined up like pearls along an invisible nylon string, hence the name "String of Pearls". Both ends are fixed to bases, similar to the table bases for bouquets, just a bit heavier and usually standing on the floor. A brick or sand filled balloon will do the job and can easily be decorated nicely. Tight budget? Plan and create the perfect cheap wedding with Cheap Wedding Solutions. With hundreds of articles, tips and ideas, you're sure to save. With a "String of Pearls" - often used for wedding balloon arches - you create an amazing effect with relatively little effort. The only disadvantage is the short lifespan, due to the nature of helium filled latex balloons, as explained above. If the decor for your special event should last longer, you could either use mylar balloons instead of latex or you go for an arch with air filled balloons. The conduit or rod is shaped into the actual arch and the balloons are attached to it, mostly in clusters of three to five balloons. By using different colors and placing the balloons in a special way you'll get this nice spiraling effect shown on the photo. Don't panic, we'll explain step by step and with lots of photos how to do that! Depending on the size of the arch you'll have to blow up quite a few balloons! So, get your family and friends ready! Alternatively you could use a hand pump or even rent or buy an electrical inflator. This investment, of course, only makes sense if you are planning to do many more balloon decorations. A much simpler way to build an air filled balloon arch is by using so called 'Link-o-Loon' balloons. Placed as impressive eye-catchers at either side of an entrance or head table at a wedding, balloon columns are ideal for wedding balloon decorations. They also make great balloon decorations for marking out an area of your venue, for example the dance floor or the stage decoration. a sturdy base as anchor for the pole. The balloons are tied to clusters of usually three to five balloons and fixed to the pole, layer after layer. By using bigger balloons for the bottom and the top, and smaller balloons in between, the balloon column takes the characteristic shape of its model in the "real" world. To crown your work you could place a stuffed giant balloon on top of the balloon column. Like with the air filled arch, both of these balloon decorations mean you'll have to blow up a lot of balloons! So, renting an inflator would be a good idea, especially for blowing up the giant balloon that crowns your column. Alternatively you could fill only the balloons at the bottom with air and the rest with helium. That way you won't need a sturdy base and a pole, as the balloons will support themselves. Use a nylon line to attach the balloon clusters to. If you need the display just for one evening, a helium filled balloon column will do fine. It saves you the hassle of building a frame and renting an inflator. On the other hand, helium costs more than air and the lifespan of the balloon decorations will be much shorter. Unsure which balloon decorations to make? Then have a look at our balloon decor checklist ... it summarizes the key points to consider in making your choices.